This package contains two small base units with a cupboard and a beaded drawer in each, and four open painted shelves-perfect for your freestanding kitchen look. 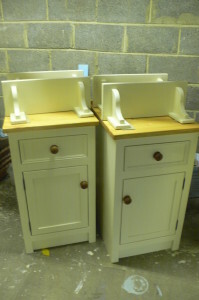 These simple freestanding kitchen units and shelves have been painted in a cream ‘tallow’ (F&B),with a 27mm waxed and waterproofed worktop on each of the base units,and matching wooden handles.Delivery included up to 250 miles. base units height 955mm,width 500mm,depth 620mm. add £60 for 40mm oak worktops.